Obituary for Ramona "Jo" Holmes | Binkley's Funeral Service Ltd. 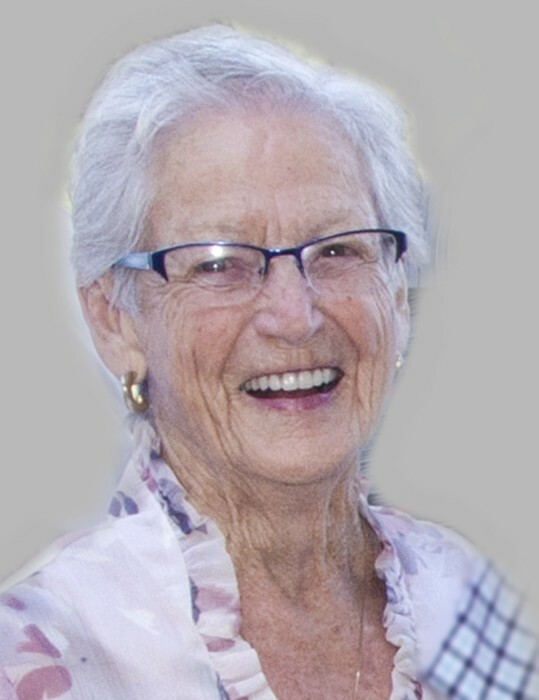 It is with profound sadness that we announce the passing of Ramona “Jo” Holmes of Maple Creek, Saskatchewan, at the age of 87 years on April 9, 2019. Ramona "Jo" June Holmes (née Gregson) was born near Paynton, Saskatchewan on June 25, 1931. Jo was predeceased by her parents, Charles and Blanche (Carpentier) Gregson, her brothers Stanley and Russell, and her sisters Gladys and Ruby. She is survived by her childhood sweetheart and husband of 67 years, Gordon, her brother, Tommy (Irma), her sister Patsy, and her children Peggy (Neil) Duncan, Dena (Randy) Burt, Blair (Peggi) Holmes, Ritchie (Gayle) Holmes, and Keith (Arlene) Holmes. Jo is also survived by her many grandchildren and great-grandchildren as well as numerous nieces, nephews, extended family, and friends. Gordon and Jo grew up together in Paynton, were married in 1952, and started their family in 1953. Gordon's work with the PFRA took them to Netherhill in 1959 and then to Maple Creek in 1966, spending their first year in a house on Main Street and then into the family home on Myers Crescent where they made their home together for the rest of their lives. Gordon and Jo raised their five children in Maple Creek and spent many happy years curling in the winter and travelling to baseball tournaments in the summer. Friday night socials at the Holmes residence were a popular activity. Throughout their lives they spent many wonderful days and nights camping with family and friends. After Gordon’s retirement, they travelled Canada and the United States together in their motorhome. Jo loved sports and cheering on the Toronto Blue Jays and Toronto Maple Leafs and knew the name of every Canadian involved in elite-level curling. Her several deepfreezes kept her delicious cooking and baking ready for the many visitors she and Gordon entertained over the years. In her later years, Jo loved weekly bridge with her friends, aquasize in the community pool, crossword puzzles, tending her huge garden, and faithfully playing with and walking the dog every day. Soft but strong, she was the consummate caregiver and always put her family first. She worked hard her entire life but never strived for the spotlight, preferring to quietly support her family and friends in the background. She never left Gordon’s side and was a wonderful wife, mother, grandmother, sister, and friend. She passed away peacefully surrounded by family at the Cypress Regional Hospital in Swift Current, Saskatchewan after suffering a sudden hemorrhagic stroke the day prior. Many thanks to the staff of Southwest Integrated Healthcare Facility, Maple Creek Regional Ambulance Service, and especially the Cypress Regional Hospital for their loving care in Jo’s final hours. A celebration of her life will be held at 2PM on Saturday, April 13, 2019 at Saint Mary the Virgin Anglican Church in Maple Creek (sorry, Grandma, we know you didn’t want a fuss). A private family interment will follow the service. All are welcome for refreshments immediately following the service in the Anglican Parish Hall. In lieu of flowers, the family welcomes you to make a donation in Jo’s name to St. Mary’s Anglican Church. Plant something nice for her in your garden this year, and if you don’t have a garden, something small in a pot by the window will look really nice.